UK shoppers continue to show their support for Fairtrade, with new independent sales figures revealing that retail sales for Fairtrade grew by 7 per cent in 2017. 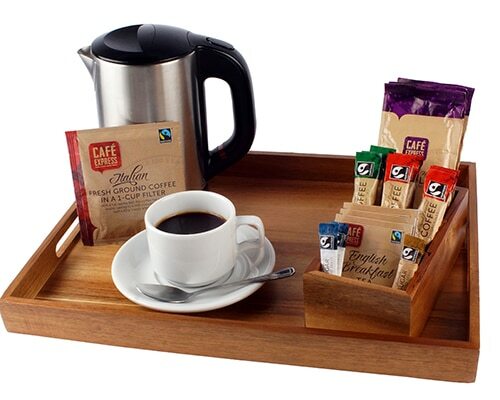 This information, supplied on the Fairtrade.org.uk website back In February 2018, demonstrates that consumers continue to care about the products they buy for their homes. For Foodservice operators this growth provides a huge opportunity to engage the increasingly socially aware consumer through providing Fairtrade products across their outlets. The Café Express range of premium individual drinks sachets from our supplier Single Source are the perfect solution for high street catering operators, hotel, leisure and travel sectors. The range of sachets are ideal for use in hotel bedroom trays, ensuring customers enjoy a premium coffee experience while relaxing in their hotel. The reassuring Fairtrade icon on the sachets will be appreciated by the more discerning consumers, whilst also contributing to the business’ corporate social responsibility commitments. Available in white sugar, brown sugar, coffee sticks, filter bags, tea bags and hot chocolate sachets, the Café Express range of individual drinks sachets are made with the highest quality ingredients and are Fairtrade and Rainforest Alliance certified. The figures quoted above back up the findings of the Fairtrade Foundation, which show public support for Fairtrade at an all-time high. New data shows that 93 per cent of people are aware of Fairtrade while 83 per cent of people trust the Fairtrade Mark. By providing a Fairtrade option everyone wins – the farmer, the catering operator and the consumer. For more information on the Café Express range from Single Source, contact Bunzl Catering Supplies today.